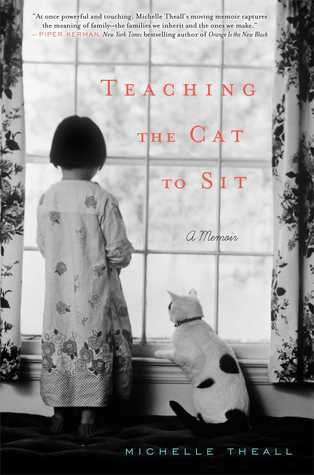 TEACHING THE CAT TO SIT is one of those rare memoirs that works as a page-turner of a story and vivid account of intense personal transformation. With profound emotional intelligence, Michelle Theall navigates her conflicted relationships with her mother and the Catholic Church, while bringing her insight to bear on her love for her life-partner, Jill, and their adopted son, Connor. She writes with an adventurous style and humor, even about her struggle with MS, as when she says "And then I did what every sane person who has been diagnosed with a progressive neurological disease would do: I booked a trip to Africa to climb Kilimanjaro." (p.238) I especially loved her revelations about overcoming her fears of intimacy to fall in love with Jill. When she wrote "I shut up and tried to save myself from myself" (p.250), I knew that her courage and sense of humor would lead her (and the book) all the way to an immensely satisfying conclusion. This is a great read, richly worth your time. Ms. Theall bares her heart and soul honestly, yet delicately, in this magnetic memoir; and I am forever grateful to her for doing so. I won’t pretend to possess the capability to clearly articulate how reading this book made me feel; or even how just one little line has stuck with me, becoming my mantra, holding me up, allowing me to cling to hope while releasing those nagging questions that will never have satisfying answers.My gratitude extends to Ms. Gail Storey, an accomplished author, kind soul and just all-around awesome person, for writing such a captivating review and recommending this gem to me. Despite an almost insurmountable stack of To-Read and To-Review books that beckon to me from every room in my home; I purchased Teaching the Cat to Sit immediately after reading Ms. Storey’s review. Upon arrival, it settled into a Some Day Stack, patiently. The waiting period was brief. Recently, feeling emotionally raw and shattered, in need of a maternal parental unit that I no longer have, I desperately turned to Ms. Theall, and my healing began. I don’t have real problems. Ms. Theall did, and continues to; yet these issues that could bury the average person do not define her, nor does she allow them to limit her. As I read about the brutality, harassment and persecution that she has been subjected to, I felt deep sadness, empathy and an over-all disappointment with the many humans that treated her this way. Then I became angry. No, furious is more accurate. Ignorance should no longer be “bliss”, it should not even be acceptable, and the “everyone’s entitled to his opinion” should be amended to “everyone’s entitled to his informed opinion.” While I feel bitter, nasty and downright hateful towards those that caused Ms. Theall, her partner, and their son grief and suffering; Ms. Theall is clearly the better person, cruising right along on the High Road. That, to me, is true inspiration. With a soft, but strong voice, Ms. Theall becomes that girlfriend that you immediately and completely relax with. She possess that unique and enviably trait of seeing herself honestly. With a strong sense of humor, compassion that can’t be hidden or even understated, and the simple, sure sense of always doing the right thing, Ms. Theall’s story is captivating, charming, honest and hopeful; catapulting her to the top of the list of awe-inspiring, formidable women that I admire…..think Cheryl Strayed, Gail Storey, Maggie Stiefvater and Marie Manilla to name a few. These women would deny the accolades, maybe blush, and say that they are no different than anyone else, and they do believe that; but I know better. They are courageous, strong, resilient and tenacious. I will go right on admiring them, singing their praises, and attempting to emulate their outstanding, admirable traits. In this memoir, Michelle Theall examines her relationship with God, the Catholic Church, and her mother in light of her homosexuality. As a 43 year old mother of a 4 year old boy in a committed relationship she struggles to balance the life she has built for herself with the Catholic Church that she loves but who doesn't seem to want her or her family to be part of it as well as still trying to live up to the expectations of her overbearing mother. The chapters alternate between her childhood and the present day giving the reader insight into her upbringing and how it has informed the woman she is today. This book was wonderful. I cannot recommend it highly enough. Not only is at an interesting story in its own right, the author is an amazing writer. Even when writing about the stuff of every day life she compels the story forward making the end of each chapter feel like almost a cliffhanger. Since the chapters alternate between the past and present the thread doesn't pick back up until 2 chapters later, which is constantly pulling the reader forward. I could not put this book down. “Teaching the Cat to Sit” by Michelle Theall, published by Gallery Books.Category – Memoir Publication Date – February 25, 2014Michelle Theall knew from an early age that there was something different about her. She did not know at the time the life wrenching and life changes that this “different” would cause her.Michelle grew up in the Texas Bible Belt the daughter of a strict Roman Catholic mother. She was brought up with a strong belief in the Catholic Church and its teachings. Throughout the book she will attempt to hold on to these beliefs even though they will cause her great pain. The pain, not only of the possibility of losing her faith, but also her family. It was not until college that Michelle came to the realization that her “difference” was that she was gay. She had a hard time accepting this and did everything she could to try and pursue a heterosexual relationship. Michelle, on finding her life partner, decides to adopt a child. The child is enrolled in Sacred Heart of Jesus Catholic Church. It is here that a major life change occurs. Even though she has been told that being a lesbian will not affect her son’s situation in the school and church, she becomes blind-sighted when she tries to have her son baptized. The ensuing problems this family must face from the Catholic Church, her parents, and media cause them to reevaluate their beliefs. Although Michelle has done everything she can to hold on to her faith and accommodate her parents she must now make a decision that could separate them forever.A beautiful story that shows the tough decision one must make in life that could completely destroy everything we have been brought up to believe, but also a story of tremendous courage to face these kind of problems with the surety of righteousness. There I was; at the library; browsing the nonfiction/memoirs section. I didn't know what I was looking for, but I knew I was looking for something. Then I came across this quirky little title. Combined with the cover, I knew that I was going to be checking this book out. (Yes, I judge books by their covers and titles, so sue me. I will actually be touching on this subject in an upcoming Musings Monday.) I've been trying to get myself in the swing of reading more nonfiction, especially since I no longer get doses of information and history through college courses. I figured that memoirs would be a nice transition to getting back in the swing of it. So, a long story later, I left the library with Michelle Theall's memoir in tow. In her life story, Theall focusses on what it was like growing up a strict catholic and the impact that had on her when she finally accepted that she was a lesbian. She went through countless stages of denial and was rejected by her parents after coming out to them. The story is told both through the past and present (alternating every chapter) to convey where Theall was and how far she has come. The past focuses mainly on incidents that reflect how she was different than what the religion would consider normal and how that had a huge impact on her psychologically, while the present centers around her, her partner Jill, and their adopted son Connor and how they're still working to integrate into society. Theall has not had it easy accepting who she really is, and her present situation in her memoir (taking place in 2010) is not making it any easier for her.First off, I really loved how this memoir was set up. I loved the flip flopping of chapters back and forth from present to past. It was a fantastic strategy to keep tension flowing throughout her memoir, something that can be hard in nonfiction writing. This strategy really made the book come together as well, since you could kind of put together her life pieces to make the person that she has become. It was also was very cool to see her simultaneously come together at such pivotal points of her life. However, even given this great strategy, the story wouldn't have come together nearly as well as it did if Theall's writing didn't also shine. I found her voice easy to read and her writing flowed smoothly, causing me to devour this book in chunks. I probably could have finished this in one sitting if I didn't have this weird reading strategy thing going to try and optimize my time between all the books I'm currently reading. (Don't ask; my reading life is currently a mess.) Theall weaves a story that is powerful, touching, and heartwarming. You can feel her emotion in her writing and can tell that she put a lot of effort into the telling of her life so far. Writing a memoir is a brave and scary thing to do. Theall completely exposes herself to her readers, something that, upon reading the book, you will find has not been an easy thing for her to do. I applaud her bravery and definitely think this was a risk worth taking. The only complaint I have about this memoir is that sometimes Theall's writing and themes can get a bit repetitive, but as this was a way to help herself heal, or at least that's how it came across to me, it's not something that I feel is a significant annoyance to touch deeply on. I am exceptionally happy that I picked up that book with the quirky little title at the library, because this was a fantastic read. I highly recommend this book, especially if you like memoirs. Theall's story is one that deserves to be read, and I give it (and her) the utmost praise for touching on a subject that has made her feel guilty most of her life and writing in a way that releases that guilt and morphs it into acceptance. This memoir is unsettling, riveting and very heartwarming and hopeful all at the same time. Theall is very honest in her exploration of her relationship with her family, the one into which she was born and the one she created and how Catholicism affected many aspects of her life growing up, her relationship with her mother and her adulthood living life as a gay woman with a life partner and a son they want baptized. Growing up in the conservative Bible Best of Texas was not easy for a tomboy; a troubled relationship with her mother who often blamed Michelle for her depression, pulling out her Catholicism and using guilt as tool, made life even more difficult for Michelle. Finally admitting she was gay was a great relief to Michelle, and coming out to her parents seemed a next logical step as she was certain they already knew. They didn’t and were not as accepting as Michelle had thought; neither was the Church in which she had grown up in and turned to in times of trouble (Michelle was diagnosed with MS in 2003). The local parish at first refused to baptize Michelle and her partner’s adopted son (who was a student at the parish’s school) and then held a baptism at a time other than right after a mass when the rite is normally conducted, encouraging it to be a community event. Shortly after, the pastor, using Catholic doctrine and the Archdiocesan rules, decides that children of gay parents are no longer welcomed in the school setting Michelle off on a writing campaign (culminating in this book) fighting for her rights as a parent and her son’s rights as an innocent, even as she jeopardizes her relationship with her own family. Michelle Theall makes a frustrating protagonist of her memoir. Plagued by her mother's cruelty and lack of acceptance her entire life, she devotes herself to being the perfect Catholic daughter to pay penance for being a lesbian. It's difficult to see how she drags her partner, Jill, and their adopted son, Connor, through uncomfortable situation after situation, whether it's ongoing battles with the Church to have Connor baptized despite the priest's clear homophobia, or brushing off Jill's complaints about being at Theall family gatherings where Jill is explicitly and intentionally shunned. I kept reading, eager to find out how the author's life progressed, whether she eventually realized the futility of living for a woman who had never shown true love for her. No such luck. Although she makes some growth and does occasionally reflect on her extreme internalized homophobia, Theall is never able to cut herself off from her callous parents — a mother who refused to talk to her after Michelle came out to her, after years of suffering in the closet as an adult, and declared her daughter dead, and a father who said, "You must have done something to provoke it" when Michelle finally tells her parents about being raped as a child. Instead, she continuously makes excuses for her parents' behavior, claims that her mother acts out of love, and strives to live her life to please them. While Michelle Theall's story is engaging, with a mix of present and flashbacks, her inability for self-reflection and recognition of her self-destructive tendencies make it an ultimately disappointing read. “Teaching The Cat To Sit” is not a book about animal training. However, the title does invoke an act that does not come normally to a cat. Suppose everyone thought that cats ought to sit, and you were that cat. This is the dilemma faced by Michelle, a gay woman facing expectations from her parents and society as strange to her as the cat taking the sitting lesson. Michelle also explains the title in one chapter of the book, however I interpreted it as a double meaning. Teaching The Cat To Sit is not just a book for gay parents, or gay people. This book will tug on your heartstrings with every page. In her detailed memoir, Michelle Theall records her lifelong struggle to feel loved and accepted within her family, but especially from her mother. Michelle describes her struggle from adolescence until adulthood to stay true to herself, while also staying true to her religion. The book is written with great detail, and with an eloquence that makes it impossible to put down. It gives great perspective on current issues within gay rights and the church, and will leave you with a new insight that will question your past thinking in its entirety. In the end, “Teaching The Cat To Sit” left me in a state of self reflection, and a desire to access how accepting I am of myself. This is a book that will stay with me for the rest of my life. Well done! I'm a sucker for most memoirs that are written by not-terribly-important people who have an honest and interesting story to tell. This is one of those stories.I was drawn to the book from the title, though I'm sure I found a recommendation for it in another source. Who teaches a cat to sit, anyway? (Michelle did. )I'm always fascinated by people who grew up strongly Catholic. I have no idea how it feels to be under the sway of a family with such an immense connection to being Catholic. I was very interested in reading a story about a woman who wanted to be a part of a group that rejected everything about her, both because she was an honest believer, and because she wanted her mother to love her.For my Goodreads friends who think that being gay is a sin: this book probably won't change their minds. I wish it would. It is a simple story about love, and a woman who loves God, her partner, their son, and her family. It would be nice if her story ended with unconditional love and acceptance. But for most people in similar situations, that's as hard to imagine as teaching a cat to sit. Brava Michelle. “This book is especially for anyone who has struggled or is struggling with growing up Catholic, is gay, has experienced sexual assault and wants nothing more than real love and human connection with their parents.As one such person, I could not put this book down once I started reading it. It is boldly and beautifully written with honesty, sensitivity, depth, compassion, humor and insight that I have not found in other books on this subject. You owe it to yourself to read this book for deeper inner healing. Because Ms Theall's book is so personal, she touched my soul in a way other books have not. I personally feel I can heal on an even deeper level now. This book is a must read for anyone and everyone. I did not have the opportunity of having closure with my parents but Ms Theall showed me how this could have been possible. This book is also for anyone who knows and loves someone who is gay (which means everybody)! No, the book is not about teaching your cat to sit, instead it's about learning to be your authentic self. Cats don't sit on command, it's not who they are, and Michelle Theall is the cat who tries so hard to be a dog in a doggie world. Those of us who are not gay are still able to relate to her story of guilt, betrayal, low-self esteem, and finally a bit of acceptance. I made it through this very readable book in 2 days. At first, the title and the cover made me pick up the book, then the way it was written justified my selection. It's an wonderful book whether you are straight or not. It is about someone finding an identity through many struggles, disappointments and finally proving that it only makes them stronger. In the end, I was really happy for the author. I absolutely loved spending my time with this book. I feel like I know Michelle personally after reading her memoir. She writes beautifully, and bravely, as she shares her deep and emotional personal story. I'm very glad I stumbled onto this book. I will start out by saying I got this book as first reader. I really enjoyed reading it. There were times I actually teared up. I felt Michelle did a great job telling her story. 0.5 Stars (I received an ARC from NetGalley in exchange for an honest review). "Nuanced and poignant, heartrending and funny, Michelle Theall’s thoughtful memoir is a universal story about our quest for unconditional love from our parents, our children, and most important, from ourselves. Even when society, friends, the legal system, and the Pope himself swing toward acceptance of the once unacceptable, Michelle Theall still waits for the one blessing that has always mattered to her the most: her mother’s. Michelle grew up in the conservative Texas Bible Belt, bullied by her classmates and abandoned by her evangelical best friend before she’d ever even held a girl’s hand. She was often at odds with her volatile, overly dramatic, and depressed mother, who had strict ideas about how girls should act. Yet they both clung tightly to their devout Catholic faith—the unifying grace that all but shattered their relationship when Michelle finally admitted she was gay.Years later at age forty-two, Michelle has made delicate peace with her mother and is living her life openly with her partner of ten years and their adopted son in the liberal haven of Boulder, Colorado. But when her four-year-old’s Catholic school decides to expel all children of gay parents, Michelle tiptoes into a controversy that exposes her to long-buried shame, which leads to a public battle with the Church and a private one with her parents. In the end she realizes that in order to be a good mother, she may have to be a bad daughter. "I could not get into this memoir and the author's writing for me was a bit difficult. The beginning was a bit confusing as well. I received this book as part of Good Reads First Reads give away.I didn't enjoy reading this book but I'm glad I read it. I found it to be engaging and interesting.It's Ms Theall's story of how she decided she had to live the life she chose instead of trying to fit into her mother's mold. At an early age Ms Theall clashed with her mother (kind of a tom boy and girly girl thing) and the relationship always remained rocky especially when Ms Theall chose to live publicly as a lesbian.Like I said, I didn't enjoy reading this book but I think it was worthwhile to read. It showed me a different perspective on the relationship between those with a homosexual inclination and the Catholic Church. I suppose it's important to understand the impact one's beliefs have on others.It's difficult to criticize a memoir. Someone is pouring out their heart and telling their story and it just feels awkward to criticize. So, I hope Ms Theall will understand but I got the impression that Ms Theall sees herself as blameless in all the difficulties she's faced. There's introspection here but it ultimately leads to Ms Theall reaffirming her own choices. But maybe that's Ms Theall's point, introspection doesn't necessarily lead to realizing one is wrong after all.Overall, I recommend this book to any one interested in what it's like growing up with homosexual inclinations and any one interested in the relation between people with homosexual inclinations and the Church. I think this is a well thought out memoir about a girl that knew for a long time that she was different, and she wanted more out life.Dealing with struggles in life like having MS, views in the church, and having her own family judge her lifestyle, she kept going on and writing about it.There were childhood dreams that didn't work out like being a track star. However, she did become a successful writer.She did confront most of her fears by the end of her book. Her parents had problems with her. She experienced abuse from a neighbor and she never told her parents because she was afraid of their reactions. But, it is revealed to them near the end of the book and she was right about how they would perceive this situation. 02/17/16I have mentioned this memoir in two of my online classes, and people are talking about it! They are looking Theall up on the Web, and they are reading her writing there. Thanks again, Michelle for the chance to read your story and for sharing it with the world. I received this book in exchange for a review, and it became a wonderful gift to me when I needed it the most. Thanks again for picking me to read & review writing. I am spreading the news about your memoir at AUM while I finish my education. Wonderful story that I read pretty much straight through because I wanted to see how it ended. Great cover as well -- I could see buyers/readers picking the book up just for that reason. Very engaging and generally very well-written. The four (instead of five) star rating is due to what seemed to be poor editing. Not typos or grammar, but too many (for my taste) of these types of sentences -- "and that was the last I saw/heard of... (fill in the blank)." After the third instance of ending a chapter/section this way, I wondered if it was intentional. If so, I found it lazy writing in an otherwise thoroughly engaging story. Another instance of the need for better editing is in the author's naming the make and model of every car that makes appearance. Sometimes this was spot on as when the author buys an SUV, but in others, such as the running tally of what her parents drove, the details were more like product placements in TV shows than telling details that moved the story forward. I received this book as a goodreads giveaway. Teaching the Cat to Sit is a very powerful and inspiring memoir that will no doubt open eyes and hearts. It’s about Michelle Theall’s experience growing up Catholic and coming out gay to her parents. Michelle is an amazing woman whose accomplishments are very impressive. The story is extremely interesting and kept me glued to the book to find out what would happen next. I would have given the book four and a half stars. My only reason for withholding the “half star” was a feeling in the end that some really intriguing threads woven throughout the story, weren’t completely fleshed out. For instance: what happened with Sacred Heart of Jesus school and the priest? Why did she mistrust her neurologist so much? Did her father attempts reconciliation? But overall, I found the book to be very good and strongly recommend it. I won this book through Goodreads First Reads Program. Frankly I'm sad that it took me so long to pick it up. This book is incredibly well written, cycling between Michelle's conservative past and the present with her partner and son. The rawness and roughness of her childhood are painfully apparent and having them parallel the way she navigates caring for her own son makes it even more tragic and beautiful. The story comes full circle and experiencing this growth from beginning to end with this family and all of their turmoil is heart-wrenching. I couldn't help but root for Michelle from page 1. She makes her experiences accessible and real without unnecessary complaint. Definitely recommend this book to anyone looking for a good, heartfelt read. This is the story of a woman who has struggled with her own personal issues, with her childhood abuse, her overbearing religious mother, and her sexuality. Through the story she comes to terms with many of her struggles, and decides that she needs to take a stand for what she thinks is right. This book will hit home to many people. You don't need to be gay or Catholic to appreciate this book. The author tries to please everyone, and in the end, pleases no one, including herself. She finally realizes that she needs to do the right thing; even if the right thing is not the popular thing.I truly found this book meaningful. I received this book as a Goodreads giveaway, and even though I received this book for free, this review is my honest opinion of this book. I won this in a Goodreads giveaway. Boy am I glad I did. I really enjoyed this book. I usually don't like books with chapters that alternate between timeframes. This is the first one I have read that it was so seamless. It was very easy to follow and all came together at the end.I hope this author is doing well with her disease. She has a long road to travel. But she has a lot to make her happy. Thank you for allowing me to read this. I highly recommend it to anyone who may think their life is so bad. They should certainly travel in others shoes to get a different perspective. I thoroughly enjoyed the book. LOVED IT! This book is so good, I have to rave!I didn't want to put it down, and when forced to - to sleep or drive or for something silly like that - I found myself ancy for my next free minute. I can't count how many red lights I prayed for over the last 24 hours.Seriously, this book is wonderful. It's written with an "edge of your seat" cadence, and an ease of storytelling that's completely captivating. The author's transparency, vulnerability, bravery and humor fill each page, and I would recommend this poignant memoir to anyone. This candid memoir of growing up gay and Catholic, while certainly addressing hot-button issues of sexuality and religion, is really a coming-of-age tale. Michelle lives in the Bible belt of Texas, with an older sister and loving parents. But her mother's strong devotion to her faith is tested when Michelle finally reveals, years later, that she is gay. The story alternates between Michelle's childhood and her adult life raising an adopted son with her partner. They find resistance at every turn in trying to raise their son Catholic. The story is a testament to the healing power of love. This book reads like a memoir, thrilled, mystery, drama, comedy. There are so many aspects to the book that I wanted to know what was around the corner all of the time. I think having alternating chapters--now and then, was a very good construct and didn't spoil the reader's sense of intrigue. More than anything, I appreciated Michelle's open-eyed honesty about herself, her life, society, organized religion, and unconditional and sometimes turbulent love. I'm fascinated by this book. Brutally honest, in my opinion, but I think that's the reason why it worked that well for me. It is always interesting to see how people dealt with issues we see now back then ( for those of us who were not even born when she was). It's not always easy to accept certain things in life but this book remained me one more time how important God and family are in our lives and the people we meet along they way as well. Wonderful, heartfelt, clear-eyed look at all the blessings and curses of mother-daughter relationships through the eyes of a woman discovering her sexual identity.Theall adds another great memoir to the canon of literature that gives hope to any LGBT young person who is feeling the clash of family, faith, and self-discovery. This memoir is about coming out and gay motherhood; "a universal story about our quest for unconditional love from our parents, our children, and most important, from ourselves." Although I am a heterosexual female, Ms. Theall is a master with the power of language that causes the reader to frequently stop to reflect, relate, laugh, and cry. It was an emotional ride that I won't soon forget.